Born: 31 January 1869, London, United Kingdom. 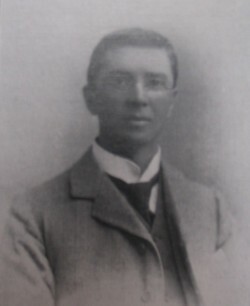 Hugh Frederick Marriott was educated at Bishop's Stortford School, Hertfordshire, and received his professional training at the Royal School of Mines, London, where he qualified as a mining engineer in 1891. He became an associate of the Royal School of Mines (ARSM), a Fellow of the Geological Society of London (FGS), a member of the Institution of Mining and Metallurgy (MIMM), and an associate of the Royal College of Science (ARCS). He came to South Africa before the Anglo-Boer War (1899-1902). During that war he organised the Witwatersrand Rifles, in which he attained the rank of Captain. While engaged as assistant consulting mining engineer by H. Eckstein and Co., Johannesburg, during 1904-1905, Marriott developed an apparatus for surveying boreholes that proved useful in the development of deep level mines. He was granted two patents covering his invention during 1904. Another of his interests was in the scientific aspects of photography. By 1906 he was a consulting engineer with Wernher, Beit & Co. He published two books: Alphabetical index to farms of the Transvaal (Johannesburg, 1904, 321p) and Money and mines: The administration, organisation and economics of precious and non-ferrous metal mines (London, 1925, 270p). His papers included "Notes on the chemical composition of the Hospital Hill shales" (Transactions of the Geological Society of South Africa, 1904, Vol. 7, pp. 27-29); "Deep borehole surveying" (delivered before the Institution of Mining and Metallurgy in February, 1905); and "A record of an investigation of earth temperatures on the Witwatersrand gold fields, and their relation to deep level mining in the locality" (Transactions of the Institution of Mining and Metallurgy, 1905-1906, Vol. 15, pp. 405-416). In the latter paper he reported that earth temperatures on the Witwatersrand increase with depth by about 1?C for every 114 meters. In the South African Mining Journal of 12 March 1910 he proposed a new method of basing quarterly gold mining reports on the "square fathom" system, rather than on the amount of tonnage milled, in order to give a better estimate of the value of the mine. Marriott became a member of the Chemical and Metallurgical Society of South Africa (from 1902 the Chemical, Metallurgical and Mining Society of South Africa) in 1898; was a life member of the Geological Society of South Africa from 1903; and for a brief period around 1906 a member of the South African Association for the Advancement of Science. By 1914 he had returned to England and was living in London. National Automated Archival Information Retrieval System (NAAIRS). http://www.national.archives.gov.za/naairs.htm Documents relating to Marriott, Hugh Frederick / Marriott, H.F.